Tribune-Star columnist Mark Bennett writes that the Census Bureau’s practice of counting federal prisoners as if they were residents of Terre Haute (“Multiple factors lead to Terre Haute posting ‘pretty impressive’ population growth“, July 18, 2009, Page D1) misses one thing: City council districts are also based on population. Each decade, by Supreme Court precedent, districts must be redrawn so that each district contains the same number of residents. In this way, each resident gets the same access to government regardless of where she lives. Unfortunately, the Census count is not the same as the number of residents and this problem is about to get worse in Terre Haute. When the Terre Haute City Council last updated the districts after the last Census, they unintentionally padded the First District with 1,764 prisoners, granting the 7,778 residents of that district as much say over the future of the city as 10,000 residents in each other district. If uncorrected after the 2010 Census, the expanded prison will be 30 percent of the district, creating an even larger vote dilution problem. Unfortunately, the Census Bureau won’t be changing where it counts prisoners in next year’s Census. But there is an interim solution: ignore the prison populations when drawing council districts. Give every resident the same say over city council regardless of whether their district happens to contain a prison. In my research, I’ve found more than 100 places like Terre Haute where the local government rejected the Census Bureau’s prison counts and choose instead to base their democracy on their resident population. The Census may count the prisoners as residents of Terre Haute, but the city isn’t bound by that count for its local districts. It is sometimes tempting to portray the controversy over where incarcerated people should be counted as a “tug-of-war between cities and rural communities”, but that runs the very real risk of obscuring how the current Census policy hurts rural communities right now. 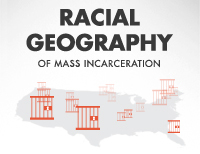 The impact of prison-based gerrymandering on state legislative districts is real and significant, but the impact on local legislatures, such as county boards and city councils, is even more pronounced. Because the district sizes tend to be relatively small in local government, a single prison can have a significant effect. It is for that reason that many of the people working the hardest for Census reform are rural people who live near, but not immediately adjacent to, large prisons. Counting inmates in council districts skews representation. 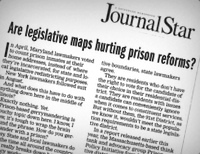 The Tribune Star reports that Council is considering a resolution to exclude the prison population for redistricting purposes.